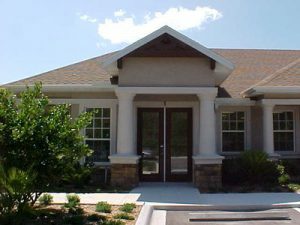 At River City General Contractors, Inc. we build custom homes, we build office parks, we develop land, Remodel homes, Reroof homes, do siding removal & replacement and more importantly we build relationships. We pride ourselves with integrity, the quality of our products and most importantly our Customer Service. Read some of the excerpts from our customers, and see why when choosing River City General Contractors Inc. we will indeed bring you and your family years of quality design and peace of mind, that you have made the right choice for one of your most valuable investments. "We were looking for a builder to build us a Block Home. After talking to several contractors we chose River City General Contractors. Mike runs a smaller operation and was at the job site most every day. He built us a beautiful new home on Heckscher and we are very pleased with it. Two or three small issues after the house was built. Mike took care of them all. Yes I would recommend River City and Mike. Thanks for the great house." 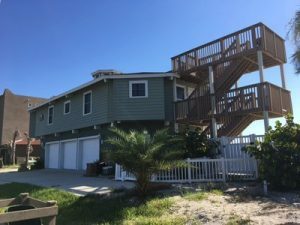 "Mike built an oceanfront house and remodeled a second house for us. The finished projects were of high quality and were completed within budget at a reasonable price. More importantly, Mike was always available for questions or advice. He acted professionally and addressed the inevitable minor issues promptly, even after the project was completed. 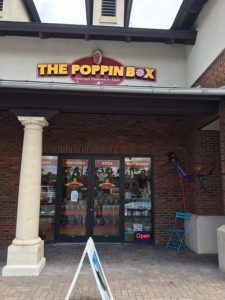 We enthusiastically recommend him as a general contractor without any reservation." "If you're looking for a quality contractor that cares, look no further than Mike and his crew!!!! 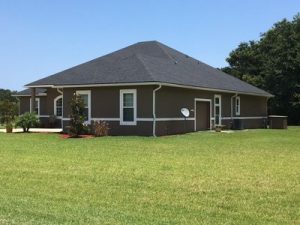 My husband and I decided to open a small business in the Julington Creek area and was given the name of Mike from River City General Contractors, Inc. We could not be more satisfied with his hard work and dedication. Not just from Mike but his crew as well. As new business owners, it can be a stressful time getting things up and running. Mike and his team understood that time is money and worked in overdrive to meet our deadline. We could not be happier with the work and will continue to use Mike as we move forward!!!" "I would like to take this opportunity to commend your construction team at River City General Contractors who created a first class professional office complex"
Addition of 16-ft. x 24-ft room to concrete block garage. Replacement of popcorn ceiling with knockdown plaster ceiling in 6 rooms. Replace carpet or laminated flooring with porcelain tile flooring in 6 rooms. 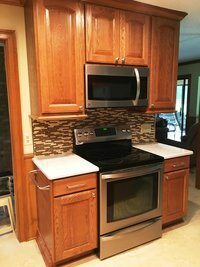 Replace wall and floor cabinets in kitchen and 2 bathrooms. Repair termite damage to walls in 2 rooms. 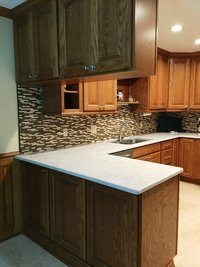 Replace countertops on cabinets in kitchen and 2 bathrooms. Paint interior walls of all rooms in house. Paint exterior walls of house and garage. Replace roof guttering on house and garage. Again, thanks to River City General Contractors, Inc. for this outstanding remodel of our house and garage."